Lent will be here sooner than you know it. This year Lent begins on March 6, 2019. Lent is all about meditating upon and learning more and more about what Jesus sacrificed for mankind. So giving something up for Lent isn't about taking something away from you. Giving up something for Lent is all about GOD GIVING MORE BREAKTHROUGH & REVELATION TO YOU as you go deeper in your spiritual walk through PRAYER, FASTING & ALMSGIVING. Many people mark Lent by “giving up” a bad habit or distracting practice, during the 40 days leading up to Easter/Resurrection Sunday. Lent provides us as Believers, with an opportunity to focus, reflect, release and be renewed and restored, tune-in to our Kingdom calling, and renew our commitment to God. So why fast during Lent? Why give up something? .....Simple: for our own spiritual growth and for the benefit of our neighbor. The truth is, for most of us, our lives are filled with things which satisfy the flesh, that lift our mood in the short-term, and provide pleasure, entertainment and enjoyment and that make us more and more disconnected from God and each other. But to give up things that we believe we cannot live without moves us away from consumerism and self-absorption to God-centered and people-connected. 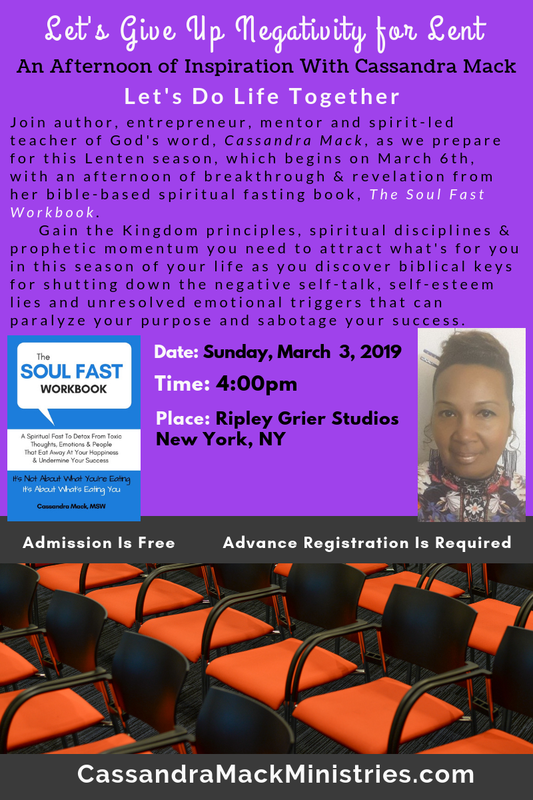 For this LENTEN SEASON Cassandra Mack Ministries will be doing the 40-day SOUL FAST form Cassandra Mack's book, THE SOUL FAST WORKBOOK where we will be fasting from NEGATIVE THINKING, NEGATIVE EMOTIONAL ATTITUDES, NEGATIVE CHOICES & NEGATIVE RELATIONSHIP DYNAMICS. This is another way of Denying The Flesh, by giving up soulish reactions to people and situations during this season of lent and prayerfully beyond it. This year, why not focus your Lenten fast on giving up mindsets, attitudes, outlooks and beliefs that do not prosper your soul by going on a SOUL FAST? You can get a copy of The Soul Fast Workbook at Amazon at the following link. Get Cassandra Mack's Soul Fast Workbook. This book will provide you with Bible scriptures and Kingdom-centered principles to support you on your 40-day Soul Fast. Unlike a fast from an edible food item or from a physical habit like watching television a Soul Fast is a master cleanse for your heart and mind. When you're on a Soul Fast you are fasting from unhealthy mindsets, outlooks, attitudes, beliefs and choices that stunt the growth of the FRUIT OF THE SPIRIT and that are counterproductive to having an healed and emotionally whole soul. STAY TUNED FOR VIDEOS and MORE INFORMATION on how you can join the 40-day Lenten SOUL FAST with Cassandra Mack Ministries.